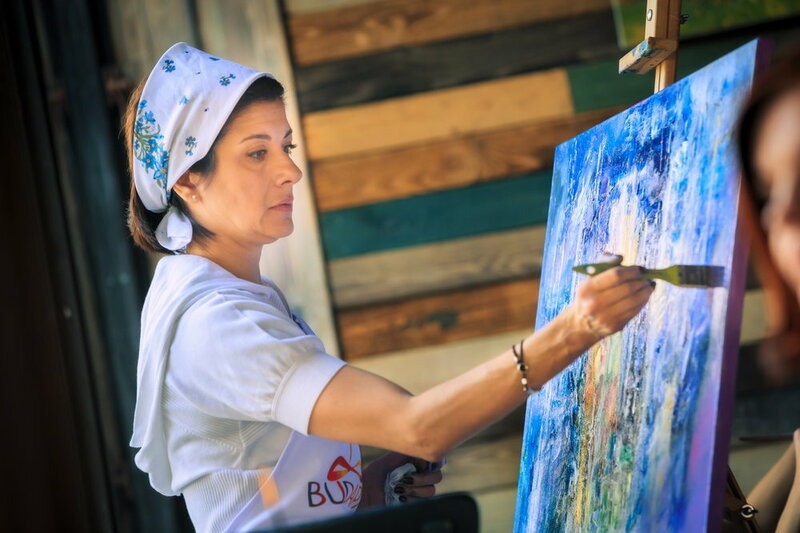 Nataliya Klyucheva’s paintings resound with a feeling of freshness, vibrancy, and delicate charm, reminiscent of music and poetry cast in vibrant colors and bold brushstrokes. Her art communicates with the viewer on many different levels and seems to open up extra dimensions – those of smell, sound, and emotion. Nataliya has been practicing yoga and meditation since early childhood, when her father first introduced her to this ancient philosophy. The series of abstract works dedicated to the theme of elements conveys a vision Nataliya experienced in her meditation and shares her emotional perception of the building blocks of existence. According to Nataliya, one of the most exciting events in her life was the publication of her book of verses for children. Most of copies were donated to a children’s wing of an oncology hospital. "I wanted to show the energies of time and their interplay in space. Perphaps, you can see lights of the city and their reflections, or people who disobey powerful currents of time and elements. A small open cavern in the rock at the bottom of the painting symbolizes something that is unknown and luring, but not intimidating. The light flowing from inside invites you to come in and promises to save you from all hardships." "The inexorable flow of time, unstoppable, like a river. The girl is an allegorical representation of life and youth. The old man stands for wisdom and the transience of the world. But there is a thing that connects them - the Living Water. A symbol of infinity, compassion, and peace."